Besides the usual post-Photokina dearth of products, the mood at the CP+ show in Japan this year was a little somber. Why? Well, the financials tell all. First let me deal with the individual companies that reported their last quarter results this week. Then I'll present commentary and charts on the overall CIPA numbers presented at CP+. Late next week I'll deal with the remaining companies. The Imaging System group at Canon reported slightly mixed news. Overall, sales were up both for the quarter and year, but these were mostly single-digit percent gains, and there was some signs of weakness showing. For example, while interchangeable lens camera sales were up 14% for the year, they were up only 3% for the quarter (year to year comparisons). In particular, Canon reported that the EOS M mirrorless camera didn't sell like they expected it to. Likewise, compact cameras declined by 6% in the quarter, meaning Canon sold fewer cameras in the Q4 quarter in 2012 then they did in 2011. Growth rate for the entire division year to year was a -0.5% (it had been projected as +16%). Canon doesn't report much in the way of unit numbers, but they do present a chart that shows how much interchangeable lens cameras change their results. While such cameras were only 31% of the unit volume for cameras during the year, they were 76% of the revenue. The unit numbers Canon did report were 8.21m interchangeable lens camera units, which was lower than their 8.8m unit guidance just a quarter ago. Why that happened I don't know, but remember the EOS M was one of the primary new products in the quarter. Also, Canon did not get aggressive with promotions here in the US in the last quarter as Nikon did, so one would have to think that their miss was somewhat intentional. Nevertheless, it has analysts wondering. Coupled with the inventory buildup (see below), it's a head scratcher. My personal suspicion is that the Canon was mostly satisfied with their overall profit numbers and hopes that the yen depreciation will boost that further as they sell off inventory. Both Canon and Nikon seem mostly silent on rebate promotions in this first quarter of 2013, after all (Olympus is still going strong on camera and lens rebates). Canon's estimates for calendar 2013 (which matches their fiscal year) show them again projecting interchangeable lens camera growth (+12%, which is 9.2m interchangeable lens cameras in 2013), but an overall decline in total cameras sold (-1%). This would further distort the value ratio to 35% of the units sold and 80% of the revenue. Put another way, Canon will sell fewer compact cameras next year, and they'll only contribute 20% of the sales numbers. Overall, Canon is predicting a large growth in profit for the coming year. But two things caught my eye in the overall presentation: (1) Canon's inventory is increasing year to year (as is the turnover time); this means that goods aren't speeding through from manufacturing to customer as fast as before, though because this is a company-wide number, it might not be camera inventories that are the issue; and (2) free cash flow from operations has been declining; indeed, it appears that cash flow from investments is doing better than cash flow from operations. A common problem amongst the Japanese companies is that their ROI for new products has plummeted. No one is seeing a big bang return from producing the latest and greatest product any more. That said, Canon's Imaging System group is profitable and looks reasonably healthy despite the contracting market at the low end. That's more than most of the other camera companies can say. 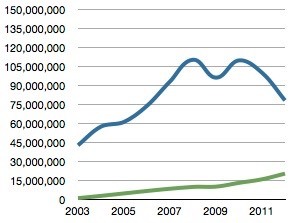 Fujifilm's camera operations are small compared to their overall corporate sales. Indeed, all of their imaging group, which includes film and paper sales and instant cameras, amounts to only 14% of the company's revenues. The bad news is that number is going down, and that group is still showing a loss, mostly because of digital cameras. In Fujifilm's words: "In the electronic imaging business, a decline in overall demand for compact digital cameras caused sales to decrease." Curiously, Fujifilm's wording about how the X series of cameras are selling is "sales…proceeded smoothly." Fujifilm also avoids talking about the year-to-year quarter differences, using only the nine-month total to suggest that the profitability (excuse me, lower losses) is improving. But the latest quarter numbers versus a year ago tell a different story (remember, this is a quarter in which final Christmas shipments should be reflected): 100 million yen loss last year versus a 1.7 billion loss this year. Moreover, when you look at the actual split for cameras, the nine month numbers show a -21.7% change year to year. Oops. "Demand…dropped 33% from previous year and 45% from the year before." "Demand started to decline…in the BRICs, where the Company expected demand to grow steadily." "High-end models…could not cover the impact of the decline in sales of compact digital cameras." Fujifilm didn't sugar coat the problem. Basically, they need to sell far more X products at higher margins, and they haven't been able to do so to cover the losses being sustained in compacts. They state they are trying to reduce fixed costs in cameras, but the bottom line sure seems like Fujifilm will have to get by on fewer camera sales, and mostly at the higher end and "differentiated models" (which Fujifilm listed as long-zoom bridge and waterproof). The X series of mirrorless cameras seem like they'll remain core to Fujifilm's camera plans, though. The worry about the "fixed cost" reductions is that it is going to be applied to sales groups, too. In other words, the company selling your dealer the camera in the first place. We've already seen what happens when sales operations are cut back: support goes quickly with it. Panasonic, meanwhile, reported that their cost reductions and restructuring has them back in the black for the last quarter of calendar 2013, but a bit disturbingly, cameras weren't a big enough part of their remaining businesses to get any real direct mention in their financial conference (there were some minor comments made to the press afterwards, but nothing particularly revealing; basically that all their consumer digital products were in decline). In looking deeper into the Panasonic financial information I noted something I hadn't really paid a lot of attention to before: about half of Panasonic's sales come in the Japanese market. That's across all products. In looking more closely at Panasonic's numbers it became clear to me that how their camera business is doing isn't exactly the biggest problem on their plate. The fear amongst those of us who like the Panasonic m4/3 offerings is that, as Panasonic wields the ax and cuts entire sections from the company, the small money-losing camera bits might be one of the casualties. I think that a long ways from happening, as Panasonic has a lot of underperforming assets that aren't generating ROI and have no ability to turn the corner. My suspicion is that the camera group at Panasonic is much like the camera group at Fujifilm: small enough to be tolerated, but under a lot of pressure to turn the results around. CIPA is the industry-wide organization that tracks sales and shipments. All of the camera companies supply anonymous information to CIPA, which then aggregates it into monthly summaries of the entire industry. CIPA released their first 2012 full-year numbers: total shipments of all cameras for the year slipped to 98.1 million units, a 15% year on year drop. Most of that was due to compact cameras, as interchangeable lens camera shipments grew to 20.2 million units, a 28.4% gain. Note that these are shipments from the manufacturers, not sales to customers. Lenses rose 16.7% year to year to 30.4 million units. But look at those camel humps in the compact numbers (blue line in graph above): we're back to 2006 levels of shipments, with no end to the decline in sight. CIPA's forecast for 2013 is for a decline in overall camera shipments to 87m units, which is another 11.3% drop. Interchangeable lens cameras are forecast to hit 22.7m units, a 12% gain. In other words, even in the one part of the market that's growing, the growth rate is dropping (by half). Most of you reading this are mirrorless advocates, and are probably hoping that mirrorless is the bright spot in cameras. Not exactly. About one in five interchangeable lens cameras shipped were mirrorless, and the 20% mark is indeed an improvement from last year; the 2013 forecast is that this will hit 25%. So, yes, DSLRs are being eroded, but slowly. That does mean that DSLR sales growth should decline slightly in 2013, though. The forecasts are a bit of self-prophecy, but rarely tightly accurate. Canon and Nikon are the two primary DSLR makers: they must be forecasting a whopping 17.6% drop in DSLR shipments for 2013 according to CIPA's numbers. That seems to indicate to me that they don't have much in the way of new DSLR models to launch this year. As we note, above, Canon has publicly forecast an increase interchangeable lens camera shipments for 2013, so we're left with five possibilities: (1) the forecasts they gave to CIPA are wrong; (2) Canon's estimates given at their recent press conference will be revised downwards (i.e. 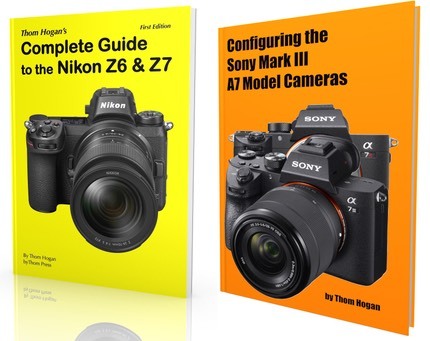 were wrong); (3) Nikon is expecting a collapse of DSLR sales; (4) the increase in Canon's interchangeable camera volume comes from increased mirrorless camera shipments; or (5) someone's gaming the forecast system (if you make future DSLR sales look low but you're about to launch a salvo, you might goad mirrorless makers into putting more product into the market as you're about to wallop them, or you might have your next quarter numbers look like a big market share when contrasted to the forecast). Of these, I'd bet on a combo of 1, 4, and 5: they somewhat underestimated their CIPA forecasts to make their market share numbers look good early on, and they have significant mirrorless production they'll ship in 2013. CIPA shipments are not actual camera sales to customers. CIPA lists two numbers: production and shipments. Production is what the camera makers actually produced in their factories. Shipments are what they sold into distribution (subsidiaries and distributors). As I write this, there's a substantial amount of existing inventory in the distribution and dealer pipeline. We had a fair amount of year end activity in interchangeable lens cameras (D5200, D600, 6D, EOS M, GH3, E-PL5, E-PM2, NX300, NEX-6, NEX-5R). That's somewhat typical of post Photokina. One final point for those trying to understand the camera marketplace: in 2012 the total sales for compact cameras were 714b yen, for interchangeable lens cameras 753b yen. Worse still, two companies dominate the DSLR sales, which were 628b yen (that means that mirrorless sales were 125b yen). *The average sale price of cameras in production for mirrorless during the year were lower, though: 23,441 yen (US$254.28), which indicates that the higher end mirrorless cameras (e.g. OM-D E-M5, NEX-7) were what the companies were mostly shipping and some of those may have been produced in 2011, while lower cost new product probably sat in inventory for the time being (at least 272,133 units according to CIPA). 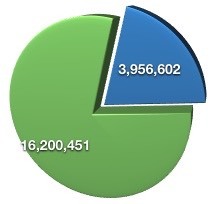 DSLR: You have two main companies (Canon and Nikon) dominating the 628b piece. Two other companies (Pentax and Sony) have very small portions of this piece. 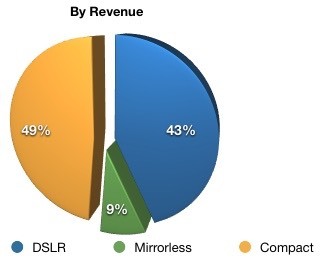 Mirrorless: You have nine companies (Canon, Fujifilm, Leica, Nikon, Olympus, Panasonic, Pentax, Samsung, and Sony) scrambling over the smallest 125b piece, with no one having a large enough share by themselves to say they're dominating. Compacts: You have over a dozen companies (add Casio, GE, plus others) fighting over the rapidly declining 714b piece, again with no one having a large enough share to say they're dominating. There is no other takeaway than this: only Canon and Nikon have a strong sales core that's still well protected and has grown through 2012 (remember, they dominate the big DSLR piece, but also are leaders in the compact piece, plus both are now players in the mirrorless piece). The pie is getting smaller overall, but you have about 10 companies fighting hard to keep themselves fed in the smallest piece and the big declining piece. My problem is that I don't see the mirrorless part of the pie growing fast enough to help all the folk fighting for it. I strongly suspect that we'll see more than one of the competitors in mirrorless become what Steve Jobs called "a hobby business." They'll stubbornly stick around and keep trying to make a commercially strong product, but they'll be low volume, with little or no profit in doing so. More to the point, you can't keep a worldwide distribution system fully staffed and supportive with low volumes of product. Even just giving a dealer 15-20% margin can make the whole enterprise unprofitable in a declining market with too many competitors. Thus, some of these companies are going to have to consider alternatives to the traditional way the Japanese have built global presence. What would that be? Well, consider if a company like Pentax went to online sales only, and did so with only three centers (Asia, US, Europe). Could they do better taking that route than the method they're currently using? I believe so. Disruption in a business isn't just about product, sometimes it's about sales and support, as Dell proved in the personal computer business. Nikon and Sony will be two of the last companies to declare results this quarter, with both scheduled for later next week. I'll have a follow-up article after the last camera companies report their earnings.